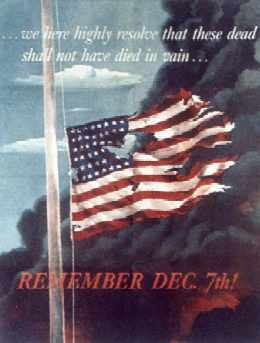 On 7 Dec 1941, just a few minutes before 8:00 a.m., aerial forces of Japan attacked Pearl Harbor in two waves. 3,500 men were killed or wounded, 18 ships sunk or damaged including all 8 battleships of Pacific Fleet. 350 aircraft were destroyed or damaged in the attack. Fortunately all three aircraft carriers were out at sea (they were the prize targets) and thus undamaged. No matter how long it may take us to overcome this premeditated invasion, the American people in their righteous might, will win through to absolute victory. I believe that I interpret the will of the Congress and of the People when I assert that we will not only defend ourselves to the uttermost, but will make it very certain that this form of treachery shall never again endanger us. Hostilities exist. There is no blinking at the fact that our people, our territory, and our interests are in grave danger. With confidence in our armed forces – with the unbounding determination of our People – we will gain the inevitable triumph – so help us God. I ask that the Congress declare that since the unprovoked and dastardly attack by Japan on Sunday, December 7, 1941 a state of War has existed between the United States and the Japanese empire. Take time to remember today those who died on this day, remember in your thoughts those who survived and families of the fallen. Check out pearlharbor.org for more information.